Joining the AAL Forum exhibition once again will be 2PCS Solutions Gmbh, winner of the 2017 AAL Forum Stand Award Prize. This Austrian start-up was founded in 2016 and is dedicated to finding new ways of providing safety and managing alerts through technological design. 2PCS products are designed so they can be used in various different living and care settings, including inpatient as well as ambulatory care. What makes the 2PCS solution distinctive is that it consists of individual pieces that can be unified holistically into one system, which can react in an efficient way to save time, cost and disburden caregivers and relatives. 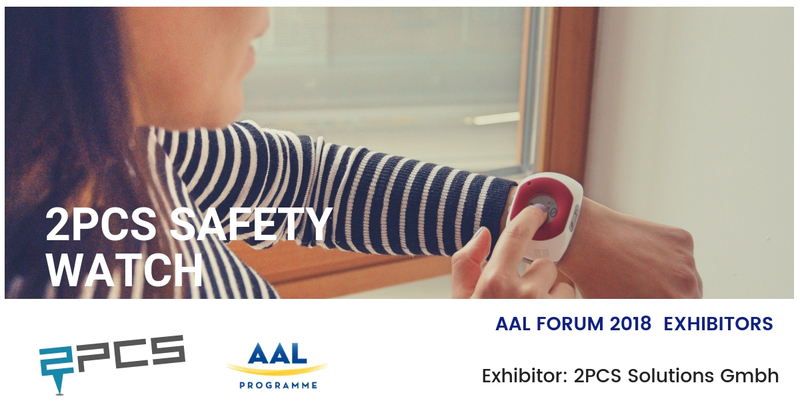 Some of the products that 2PCS will be exhibiting at this year’s forum include: 2PCS Safety Watch – an indoor and outdoor mobile emergency call and service call system; 2PCS Funkfinger – classic 2PCS device for indoor use only; 2PCS Software Platform – for emergency and escalation management, automated alarm and notifications, localise missing peoples; 2PCS Reader System – localising persons in buildings. 2PCS Solutions Gmbh is a dedicated business within the AAL ecosystem, with a project completed in the third call of the AAL JP, as well as involvement in part of the i-evAALution project, helping to identify further potentials within the ageing society. 400 households were equipped with 2PCS’s state-of-the-art technology and smart home solutions.